What an opportunity to purchase a slice of paradise at an unbeatable price! There are a handful of elevated prime properties in this suburb and seldom do they come onto the market. This family holiday home offers an incredible opportunity to personalise the existing home or to build your dream home in one of the most beautiful settings that Plett has to offer. Located at the end of a quiet cul-de-sac, bordering onto a nature reserve, this elevated property enjoys one of the finest views in Plett. Wake up to the sound of breaking waves and enjoy the magic sounds of the surf whilst relaxing over sundowners on the expansive balcony with the magic vista captured in the evening light. The property is completely secluded from neighbours and is within walking distance of central beach, the town centre, restaurants, coffee shop and all amenities. This superbly located property literally has uninterrupted 180-degree views stretching from the Tsitsikamma mountains sweeping over the bay as far as the Robberg Peninsula. Between these is a bird’s eye view of the breaking waves on Central Beach and the iconic Beacon Island with the ocean beyond. One of Plett’s original family holiday homes this older, much loved property has been immaculately maintained. Steps lead to a large terrace with stable door opening into an open plan living/dining room with a partially open plan kitchen. The living area boasts a wood burning fireplace and has sliding doors onto that supreme terrace, with built in braai, that creates an ideal indoor/outdoor entertainment area with ample space and easy flow for guests and families. The master bedroom is on this level and has double en-suite bathrooms one of which has a bath, the other a shower. Upstairs a cosy, north facing study/family/TV room, is alongside two further double bedrooms, a family bathroom and a laundry. The bedrooms share the splendid ocean views. Accessed from the upper level is a totally private, secluded swimming pool and gazebo/jacuzzi room that is positioned between the main house and a self-contained guest or staff flatlet with kitchenette. All of these enjoy spectacular views over the bay and ocean. The property is completed by a garage, drying yard and electric gate. This older and highly desirable suburb is home to some of Plettenberg Bays most sought after and expensive real estate. Properties in this area are home to the rich and famous, local and international jetsetters who prefer town to beach living. While this suburb is dominated by large, spacious older homes, original cottages and modern mansions, a sprinkling of sectional title developments too inhabits this area. 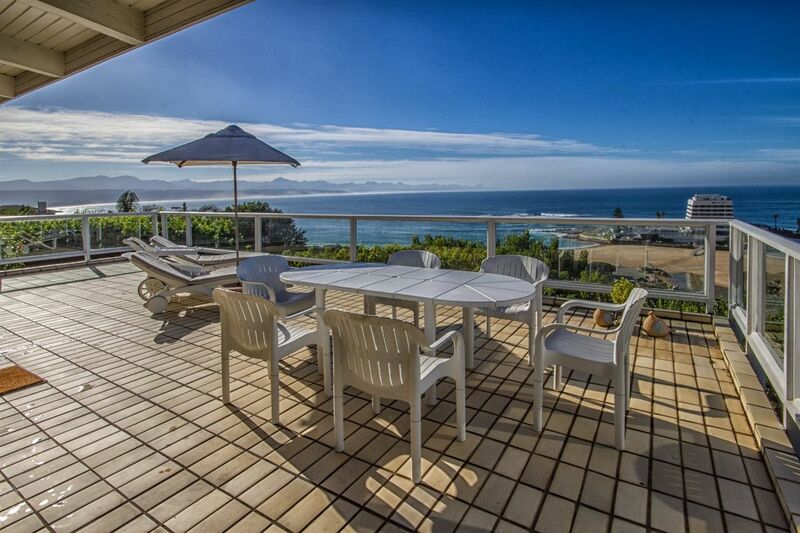 Outeniqua is one the most exclusive sectional title development in Plettenberg Bay. Lower central is within walking distance of the beach, restaurants, shops and town centre. Depending on their location, properties in this suburb can enjoy views over Central and Hobie beaches the Beacon Island and over Lookout beach, Keurbooms Lagoon the Mountains and ocean.